Crazy Horse Memorial is a massive mountain carving under construction in the Black Hills of South Dakota. The memorial was commissioned by Henry Standing Bear, a Lakota elder, to be sculpted by Korczak Ziolkowski. When completed the Crazy Horse mountain carving will be 641 feet long by 563 feet high. Crazy Horse’s completed head is 87 feet 6 inches high. The horse’s head, currently the focus of work on the mountain, is 219 feet or 22 stories high. Native American leaders chose Crazy Horse for the mountain carving because of his tenacity of purpose, his modest life, his unfailing courage, and his tragic death which set him apart and above the others. He is a hero not only because of his skill in battle, but also because of his character and his loyalty to his people. He is remembered for how he cared for the elderly, the ill, the widowed and the children. His dedication to his personal vision caused him to devote his life to serving his people and to preserving their valued culture. Crazy Horse died young, his life tragically cut short. His spirit, however, remains as a role model of selfless dedication and service to others. Today, his values and his story serve as an inspiration for people of all races. The massive sculpture is reshaping the granite peak once known as Thunderhead Mountain. Crazy Horse Memorial is owned and operated by the Crazy Horse Memorial Foundation, a private non-profit organization. The mission of Crazy Horse Memorial Foundation is to protect and preserve the culture, tradition and living heritage of the North American Indians. Located about 5 miles north of Custer on Highway 385 in Custer County, SD, Crazy Horse Memorial is in the Black Hills of western South Dakota. It is about 35 miles southwest of Rapid City, SD, and 16 miles southwest of Mount Rushmore National Memorial. Sculptor Korczak and Lakota Chief Henry Standing Bear officially started Crazy Horse Memorial June 3, 1948. The Crazy Horse Memorial mountain crew uses precision explosive engineering to carefully and safely remove and shape the rock of the mountain. 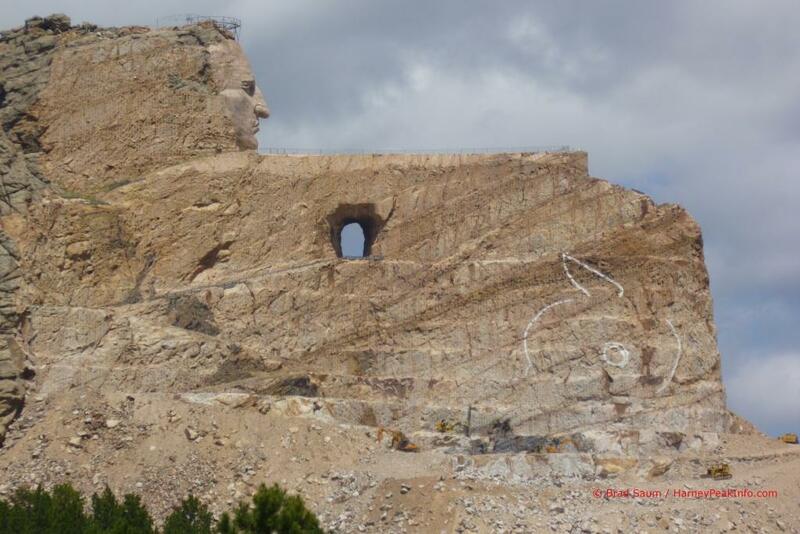 Since the dedication of the face of Crazy Horse in 1998, the work has been focused on blocking out the horse’s head. The elevation of Crazy Horse is 6,740 feet, just 500 feet lower than Harney Peak which is the highest point in the Black Hills.